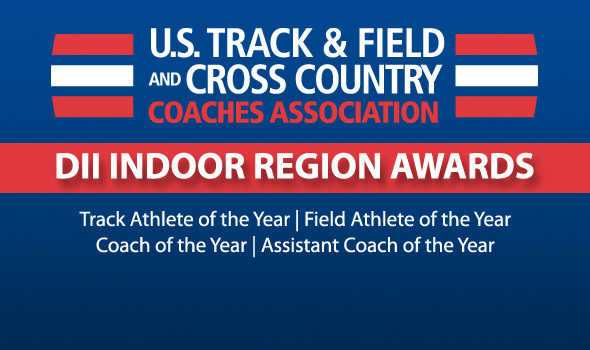 NEW ORLEANS – The U.S. Track & Field and Cross Country Coaches Association (USTFCCCA) announced the organization’s region athletes and coaches of the year for the 2013 NCAA Division II indoor track & field season on Friday. Many of the athletes and coaches will be on hand for the NCAA Division II Indoor Track & Field Championships set for next weekend, March 7-9, in Birmingham, Ala.
A redshirt junior from St. James, Jamaica, Hyatt enters the NCAA Championships as the No. 1-seeded runner in the 400 meters with a converted time of 46.77. Hyatt is also entered in the 200 meters as the No. 3 seed. He was the MIAA champion in both the 200 and 400 this season. Bredy, a senior from Hoffman, Minn., won the NSIC’s High Point Scorer Award for the third-straight year for his performance in that league’s championships. He was the conference champion and broke the meet record in the 60 meters while also take the league title in the long jump. He enters the NCAA Championships as the No. 1 seed in the 200 meters with a converted time of 21.06. A redshirt senior from Taneytown, Md., Thomas was the Northeast-10 Conference Champion in the 60 and 200 meters and was named the league’s Most Valuable Athlete after scoring 28 points. Thomas is entered in the NCAA Championships in the 60 meters and long jump. Windle, a sophomore from New Albany, Ohio, won the GLIAC title in the 800 meters, running the DII-leading time of 1:48.82. The time also ranks in the division’s all-time indoor top five under all-conditions. Windle is entered in the 800 and as a member of Ashland’s DMR for the NCAA Championships. A freshman from White Rock, Canada, Clifford ended the season as the top-ranked athlete in the South region in the 3000 meters and second-ranked in the mile and 800 meters. Stevens, a junior from Canon City, Colo., owns the No. 1 seed in the mile entering the NCAA Championships with a converted time of 3:59.56 (from a 4:04.90 at altitude). Stevens is also the No. 1-ranked 3000-meter runner in the division, having a season-best of 7:57.56, and is on the top-ranked DMR squad entering the NCAA meet. A senior from Mayor, Spain, Azcue broke team records this year in the 800 meters and mile and earned a bid to the NCAA Championships in the 800 meters via an automatic-qualifying time of 1:50.36. Chelimo, a junior Kapkoi, Kenya, is the division-leader in the 5000 meters where he owns a season-best and GNAC record of 13:51.19. Chelimo is also entered in the NCAA meet in the 3000 meters and as part of the DMR. A senior from Jacksonville, N.C., Daugherty enters the NCAA Championships as the No. 3 seed in the pole vault via a season’s best of 16-8¾ (5.10m). The reigning outdoor NCAA champions, won the PSAC title for the fourth time this season. Vogel, a redshirt senior from Jefferson City, Mo., won the MIAA heptathlon title with a conference record score of 5,450 points, helping lead the Mules to a conference team crown. He owns the division-leading score and is the No. 4 performer in DII history in the heptathlon. A junior from Newington, Conn., enters the NCAA Championship as the No. 2 seed in the heptathlon. The defending national champion scored a school record of 5,315 points which placed him No. 7 on the all-time performers list within the division. Lebron competed in six events at the Northeast-10 Championships and scored 28 points, leading his squad to a third-place finish. Postwaite, a sophomore from Rochester, N.Y., owns the second-best performance in DII this year in the triple jump with a best of 51-2¾ (15.61m). The GLIAC champion in the triple jump also claimed conference scoring honors in the long jump, finishing sixth, and in the high jump, placing seventh. A freshman from Trussville, Ala., finished the season as the top-ranked athlete in the South region in the high jump and the heptathlon. He also earned All-Region honors in the 60 hurdles, high jump, and long jump. Yamoah, a redshirt freshman from Arlington, N.Y., leads DII in the pole vault as the only to have cleared 17 feet this season, owning a best clear of 17-2¾ (5.25m). Yamoah was the Lone Star Conference champ in the vault. A junior from Salisbury, N.C., was the Conference Carolinas champion in the pole vault and enters the NCAA Championships as one of only 10 that have cleared more than 5 meters this season. Carter, a redshirt freshman, from Bakersfield, Calif., is the DII’s top-ranked athlete in the long jump and triple jump entering the NCAA Championships. He owns bests of 24-10 (7.57m) in the long jump and 51-3 (15.62m) in the triple. Williams’ squad is ranked No. 3 in the latest USTFCCCA National Team Rankings and ended the season as the top-ranked team in the region. The coach, in his 40th year at Saint Aug’s, enters the NCAA Championships with a meet-best 18 entries, including nine in the sprint and hurdle events. The Falcons also won their 16th-straight CIAA conference crown this season. Schuck, a 34-year veteran at Minnesota State, led his squad to the NSIC title with 207½ points. His team broke or tied six conference records this season. The Mavericks, with nine NCAA entries, are ranked No. 5 the nation and finished the season as the top-ranked team in the Central. Boen’s squad won the Northeast-10 Conference title, their first in school history, and currently sit 16th in the national team rankings. Her squad, who finished in the top 10 at the All-New England Championships for the seventh-straight year, has three entries into the NCAA meet. Boen is in her 15th year at the school and specializes in coaching middle-distance and distance athletes. Fangman, an 18-year veteran of the Indianapolis squad, was named the GLVC Coach of the Year after his team won its fourth-straight conference title. The U-Indy team will have 10 entries for the NCAA meet and they are currently ranked ninth in the country. Cain led the Chargers to a No. 1 ranking in the South region this season. Nine from his team led the region in their respective events this season. Cain is in his 15th year leading Alabama-Huntsville. For Martin’s squad, it was another RMAC title this season. Martin, in his 24th year, has a squad ranked No. 1 in the country and heads into the NCAA Championships with 17 entries, including 11 in middle-distance and distance events. Babb’s squad finished the season as the third-ranked team in the region. At the Conference Carolinas Championships, his team captured five event titles and throughout the season 10 school records were broken. Babb is in his second year and he primarily coaches jumps and throws. Halsell, in his 26th year, led his team to the GNAC Championship, the squad’s first in seven years. Eight athletes this winter broke nine school records. Spence, in his 17th year, instructed Matt Gillette, the PSAC Indoor Championships Track MVP/Overall Meet MVP and a distance squad that helped the school win its third-straight PSAC title. His distance squad scored 78 points in the PSAC meet and Gillette broke Spence’s own 3k PSAC record that was 30 years old. Sanger, in his second year at Minnesota State, works with throws for the school. The team has three entries into the NCAA Championships in the throws. Sutherland, the throws coach at SCSU in his 21st year, had a squad that scored 41 points at the Northeast-10 Championships in the shot put and weight throw that helped the team to a close third-place conference finish. Two of his athletes are entered I the NCAA Championships. Maag, the throws coach at Grand Valley State in his second year, has a nation-leading six men’s NCAA entries in the shot put and weight throw combined. At GLIAC Championship, his athletes accounted for 26 team points helping GVSU win their 13th title in 14 years. Freshman Darien Thorton was named GLIAC Freshman Field Event Athlete of the Year. He owns the longest weight throw mark by a freshman in DII history. Thompson, in her 10th year, helped coach the Chargers to a first-place team final ranking in the South region. The 4×400 squad captured a provisional qualifying mark and the top time in the region. Cook is a seven-year veteran of Abilene Christian as throws and combined events coach. His crew scored 24 points at the Lone Star Championships, which included a 1-2-3 sweep of the weight throw. Senior Baptiste Kerjean qualified for the NCAA Championships with the weight. Davis-Williamson in her third year with King College, helped lead the Tornado to a win of the Conference Carolina Indoor Track and Field Championships. The sprints, jumps, hurdles, and relays coach helped lead the team to a final No. 1 ranking in the region. Frankie, in his third season as a sprints and hurdles for Grand Canyon, helped the Lopes to a national ranking of No. 6 and a No. 1 final ranking in the West. GCU has five entries into the NCAA Championships in the sprints and hurdles and a total of 16 of his athletes earned 27 All-Region nods. Spratford, a senior from Califon, N.J., was named the PSAC Indoor Championships Track MVP after winning the mile (5:00.18) and 3000 (9:50.85), and ran a leg of the winning DMR (12:26). She enters the NCAA Championships as the top-seeded runner at 5000 meters with a converted time of 16:27.15 set on the opening day of qualification, and her DMR team ranks third. She is also entered in the 3000 as the eighth seed. Agnew, a senior from Onamia, Minn., enters the NCAA Championships as the only woman to have met the automatic qualifying standard with a converted mark of 4:44.59, and as a leg of the No. 1-ranked distance medley relay team with a time of 11:37.43. She was named the 2013 NSIC Track Athlete of the Year after breaking conference records in the mile and 1000. A redshirt sophomore from West Haven, Conn., Udaya was named the Northeast-10 Athlete of the Year following conference championships at both 60 and 200 meters. Entering the NCAA Championships she is seeded fourth at 200 meters with a qualifying time of 23.90 and seventh at 60 meters with a time of 7.48. A redshirt Junior from Leslie, Mich., Rudd earned GLIAC Track Athlete of the Meet with a meet-record 16:42.95 over 5000 meters and a title at 3000 (9:37.06). She enters the NCAA Championships ranked fourth at both 3000 and 5000 meters, and recorded the eight-fastest DII mile this season (4:53.67), but will not compete in the event. Simpson, a senior from Clarendon, Jamaica, enters the NCAA Championships ranked fourth at 60 meters with a school-record qualifying time of 7.47, and seeded 15th at 200 meters with a school-record qualifying time of 24.37. Both marks are tops in the region for 2013. Nelson, the 2012 DII Individual Champion in XC and a senior from Craig, Colo., posted the fastest time in DII at 3000 meters (9:32.45) and owns DII’s fourth-fastest qualifying time in the mile (4:50.06). Nelson also runs the anchor leg on the fifth-ranked women’s DMR. She will compete in the 3000 and DMR at the NCAA Championships. The only race that Nelson has not won this season was the Husky Classic 3000 meters, where she beat all DII competition. Witt, a senior from Mountain City, Tenn., was named Conference Carolina ‘Track Athlete of the Year’ by taking 28 points at the indoor conference with wins at 3000 and 5000 meters, and she took second in the mile. Thomas, a senior from San Jose, Calif., has led Academy of Art to its highest ranking in program history at No. 2 in the nation and enters the NCAA Championships entered in a nation-leading five individual events and in the pool for the 4×400 relay. On the track she is seeded No. 1 in the 60 hurdles with an 8.17 qualifying time, tied for second in the 200 at 23.84 and eighth in the 60 at 7.49. In addition, she also holds the top seed in the long jump and the sixth seed in the triple jump. Bemis, a junior from Fair Oaks, Pa., defended her PSAC titles in both the long jump and triple jump, and won the 60 hurdles in an all-time conference record 8.60. She enters the NCAA Championships seeded 14th in the triple jump (39-5¼/12.02m), 16th in the 60 hurdles and 17th in the long jump (18-9¾/5.73m). Alewine, a redshirt junior from Jefferson City, Mo., enters the NCAA Championships as the top-ranked student-athlete in the indoor pentathlon with a score of 4,153, making her the second-best in DII history and the only competitor to break 4,000 points this season. She will also enter the NCAA Championships ranked third in the long jump at 19-6 (5.94m) and fifth in the high jump at 5-8½ (1.74m). A redshirt sophomore from Somerville, Mass., enters the NCAA Championships ranked fifth in the pentathlon with a score of 3,547 and 13th in the long jump at 18-11¼ (5.77m). She was named the Northeast-10 Conference Meet Most Valuable Athlete with a title in the high jump, runner-up finishes in the long jump and 500 and a third-place showing in the 60 hurdles. Lockhart, a senior from Lansing, Mich., set a Division II all-time record in the weight throw with a mark of 70-6½ (21.50m) at the GLIAC Conference Championship. She is also ranked first in the nation for the shot put with a throw of 53-6½ (16.32m). Lockhart won both events at the GLIAC Championship helping the Lakers win their 14th straight conference championship. Brown, a sophomore from Nassau, Bahamas, enters the NCAA Championships ranked ninth overall in the triple jump with a mark of 40-0 (12.19, making her one of just nine women in DII to surpass 40 feet this season. She is the top-ranked performer in the region in the triple jump, long jump and high jump. A junior from Budapest, Hungary, Szabo is the collegiate leader in the high jump with a clearance of 6-3½ (1.92m). The clearance makes her the third-best in DII history and she is currently ninth in the world for 2013. She earned RMAC Athlete of the Year honors following her conference titles in both the high jump and the triple jump. Matthews, a freshman from Monroe, Ga., enters the NCAA Championships ranked 10th in the nation in the triple jump with a mark of 39-9¾ (12.13m). She is ranked No. 1 in the triple jump among Southeast Region student-athletes, and broke the school record in the triple jump in her collegiate debut. Duhamel, a junior from Wenatchee, Wash., finished the indoor campaign ranked 24th in the shot put with a mark of 45-7 (13.89) and 28th in the weight throw at 54-2½ (16.52m). She claimed individual titles at the GNAC Indoor Championships in both the shot put and the weight throw. In his sixth year as the head coach of the Golden Bulls, Graham will lead his team into the NCAA Championships ranked 11th with five entries into the meet. All five entries come from the sprints and hurdles discipline, Graham’s area of specialty. The Golden Bulls have been ranked as high as ninth this season. Thomas, in his 11th year with the Blue Tigers, coached the Lincoln (Mo.) women to their third-straight MIAA Championship and the No. 1 ranking in the nation with 20 entries into the NCAA Championships. Lincoln women posted eight victories at the league title meet and own the top DII times at 60 and 200 meters and in the 4×400 relay and has posted four other automatic marks. Thomas specializes in the sprints and hurdles. Gardner, in his 11th year with UMass Lowell, led his team to a Northeast-10 Conference team title by more than 90 points, marking the program’s second in a row and third in the past four seasons. The River Hawks enter the NCAA Championships with six entries and ranked 18th in the nation. Gardner’s areas of expertise are middle distance and distance events. Baltes, in his 14th season with the Lakers, guided the team to its 14th straight GLIAC title with a conference-record 140-point margin of victory. The Lakers are No. 2 in the national rankings after spending the remainder of the season at No. 1, and have a DII-best 23 entries into the NCAA Championships. Baltes’ area of specialization is the distance events. Hyland, in his eighth year with the Tigers, led his team to a the No. 2 ranking in the South Region, and will send a jumper to the NCAA Championships. The team had four female student-athletes ranked No. 1 in their region in their events, in addition to the top relays in the region. Hyland has a hand in coaching distance, combined events, jumps and hurdles. In his fifth season, Dalton led the Lady Tornado to a dominating win of the Conference Carolina Indoor Track and Field Championships by a wide margin of more than 60 points. His team was ranked No. 1 in the NCAA Southeast Region Poll for the entire season and he coached Hannah Witt to DII National Qualifying time at 5000 meters and Conference Carolina Indoor "Track Athlete of the Year" award. Dalton specializes in middle distance and distance events. In his 23rd season at the helm of the Seawolves, Friess coached the women’s indoor team to the GNAC championship in its first year of indoor sports sponsorship. Under his tutelage the Seawolves garnered five entries into the NCAA Championships and have been ranked as highly as 12th in the nation. Friess’ specialties include distance, sprints and relays events. In her second year with the program, Carleson coached 2013 USTFCCCA Atlantic Region Field Athlete of the Year Tabitha Bemis to NCAA berths in the long jump and triple jump, and to 2013 PSAC field athlete of the meet honors. Carleson’s areas of focus are jumps and combined events. U-Mary dominated the distance events, coached by seventh-year assistant Newell, to win a third straight NSIC title. Seven Marauders coached by Newell combined to win the 1000, mile, 3000, 5000 and the DMR and score 80 team points. Four NSIC and three school records were broken by his student-athletes, and he coached four entries to the NCAA Championships. Nationally, 2013 USTFCCCA Central Region Track Athlete of the Year and NSIC Athlete of the Year Melissa Agnew is DII’s top miler and ranked 13 in 800. Jennifer Agnew is ranked No. 2 in 3000 and ninth in 5000. Ekstrand, in his 18th season coaching sprints with the River Hawks, guided the 4×400 relay team to the fifth-fastest time in the nation entering the NCAA Championships. Ekstrand had six student-athletes hit NCAA provision marks at 200 meters, five at 400 meters and another at 60 meters. In his 12th season at Bellarmine, Kris Horton’s middle/long distance runners accounted for 68 points in helping the Knights to their second consecutive GLVC indoor title. At the GLVC Indoor Championships Horton’s 800 runners went 1-3-4-5, in the mile they ran 1-3-5, in the 3000m they went 5-6, in the 5000m 3rd, and the Knights also won the DMR. During the 2012-13 Indoor campaign Horton coached an NCAA Championships entry and five individual NCAA Provisional qualifiers in the middle/long distance events and the DMR. In her 10th year coaching sprints, hurdles and jumps, Thompson helped coach the Chargers to the top ranking in the South Region. She guided the team to school records at 60 and 200 meters and in the triple jump this season. She coached the South Region’s top two sprinters at 60 meters and four of the top six. Has helped coach Kedeshia Simpson to DII’s fourth-fastest time at 60 meters and the 15th-fastest at 200 meters. In his ninth year coaching jumps, hurdles, sprints and combined events, Dibbern coached two student-athletes who claimed LSC individual championships and helped coach four qualifiers to the NCAA Championships. He has coached Kearah Danville to the No. 2 triple jump and No. 10 long jump marks in DII this season, and also Jordan Gray to the fifth-best DII indoor pentathlon score. Caesar, in his 10th season working with sprinters and jumpers, has worked in developing current Laker freshman triple jumper and 2013 USTFCCCA Southeast Region Field Athlete of the Year Jessica Matthews as a top-10 DII jumper this season and Clayton State’s first NCAA indoor qualifier since 2008. Riggs, in his first season with Grand Canyon, has helped lead the Lopes to a No. 4 national ranking and were the top-ranked team in the West Region all season. He assisted in guiding four athletes to NCAA automatic qualifying marks and an additional 21 to provisional standards for a total of 14 entries to the NCAA Championships. Griggs coached the West Region’s top performers in four events and a total of 21 All-Region awards from 12 different student-athletes.